A fireplace that draws properly can be assured by applying proper principles of design. Fireplaces must have an external air supply to improve combustion. The fireplace flue should have a liner. Its size depends on the size of the fireplace opening. One rule commonly used is to take one-tenth of the area of the fireplace opening to find the minimum size of the flue; however, the outside dimension of the flue should never be less than 8x12 in. (200 x 300 mm). 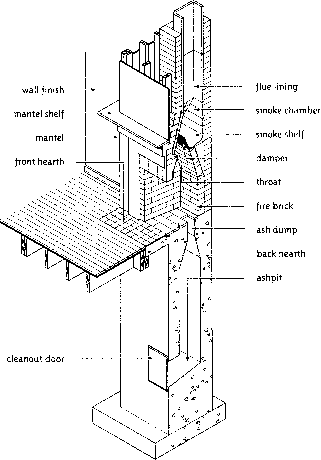 The terminology and locations of the various parts of a fireplace are illustrated in Figure 116.
a smoke shelf, to reduce back drafts, is formed by projecting the throat forward as much as possible. The throat should be as wide and shallow as possible, but in total area it must equal the area of the flue; and the sides of the fireplace above the throat are drawn together to form the flue, which usually starts over the centre of the width of the fireplace; the slope, however, should not exceed 450 to the vertical. Terms used in fireplace construction. The lining of the fire box must be built with materials having a high resistance to heat. A steel liner designed for this purpose or 2 in. (50 mm) of fire brick meet this requirement. When fire brick is used, it should be laid with fire-clay mortar or high-temperature cement. If a 2 in. (50 mm) fire-brick liner is used, the back and sides of the fireplace should be at least 8 in. (190 mm) thick including the thickness of the masonry liner. Portions of the back exposed to the outside may be 5 Uz in. (140 mm) thick. Where a steel fireplace liner with an air circulating chamber surrounding the fire box is used, the back and side may be solid masonry units 3 1/2 in. (90 mm) thick or 8 in. (190 mm) hollow units. The damper is a large valve set in the throat of the fireplace which can be adjusted from the front to regulate the draft. Many types of damper units are available. By choosing one with a correctly proportioned throat passage, the risk of failure in the function of the fireplace is reduced. The damper should be capable of being fully closed, and should be as tight-fitting as possible in the closed position to minimize heat losses up the chimney when the fireplace is not in use. The hearth may be set even with the floor, or raised above the floor level. It consists of two parts: the front or finish hearth, and the back hearth under the fire. Because the back hearth must withstand more heat, it is usually built of fire brick. The front hearth is simply a precaution against flying sparks and is usually built of 4 in. (100 mm) reinforced concrete finished with ceramic tile. The front hearth should extend at least 16 in. (400 mm) in front of the fireplace opening and 8 in. (200 mm) on each side. At the back of the fireplace, it is customary, but not essential, to have an ash dump through which ashes can be dropped into an ash pit. A cleanout door to the ash pit can be provided in the basement for periodic removal of ashes. 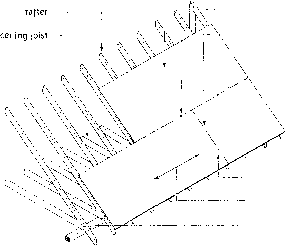 if a factory-built fireplace is used (Fig. 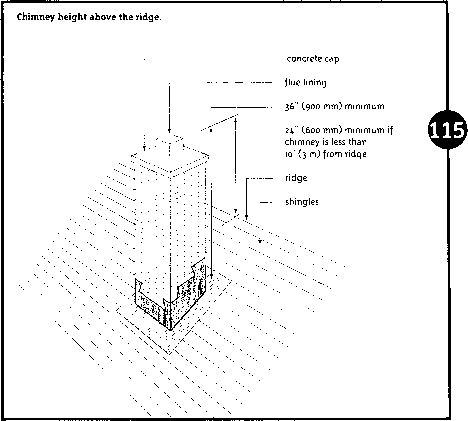 117), the same precautions should be observed as indicated for the use of factory-built chimneys. In all cases, fireplaces chimneys should be as straight as possible to properly vent the fireplace. A popular alternative for wood-burning fireplaces is now available through a wide variety of gas burning appliances (both natural gas and propane). Some of these are purely decorative and manufactured for installation into existing masonry fireplaces. However, gas fireplaces with higher combustion efficiencies and fans for distribution of the heat are also available. Ensure that these are installed according to the manufacturer's installation instructions and conform to all applicable requirements of the natural gas or propane appliance installation code.